Sunday, October 28, 2018. The Seventeenth Annual BPC Dogs Halloween Puppy Parade was held on our rain date of Sunday, October 28 - a cool fall day, but at least not raining. Here are the winners. You can see additional photos of the complete event by clicking here. Sunday, October 7, 2018 – Blessing of the Animals. The annual BPC Blessing of the Animals took place this year at the Sirius Dog Run on Kowsky Plaza. The blessing ceremony was led by Deborah DiIorio, an Interfaith Minister and longtime resident of Battery Park City. Special thanks go to Lauren Kara Photography for the first 24 of the photos of the event linked here. 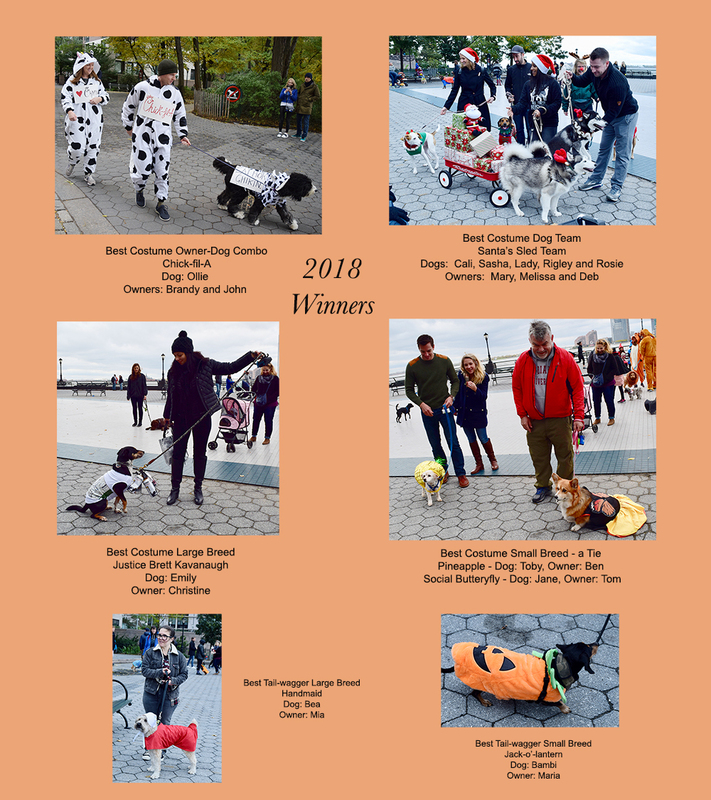 On a beautiful fall day, Saturday, October 28, we held the Sixteenth Annual BPC Dogs Halloween Puppy Parade along the Battery Park City Esplanade, co-sponsored by BPC Dogs and Le Pet Spa. Hundreds of BPC residents and neighbors gathered to enjoy dozens of dogs dressed in their Halloween best. You can see many more photos by clicking here. There was also nice coverage with even more photos in the Tribeca Trib. Sunday, October 1, 2017 – Blessing of the Animals. The annual BPC Blessing of the Animals took place on October 1st at St. Joseph's Chapel on Kowsky Plaza by Gateway Plaza apartments. As always, this was a nice opportunity to welcome the fall season with a show of love and appreciation for our beloved pets. Click here for photos. Saturday, October 29, 2016 – Once again, our Annual BPC Halloween Puppy Parade – the 15th – was a great success. 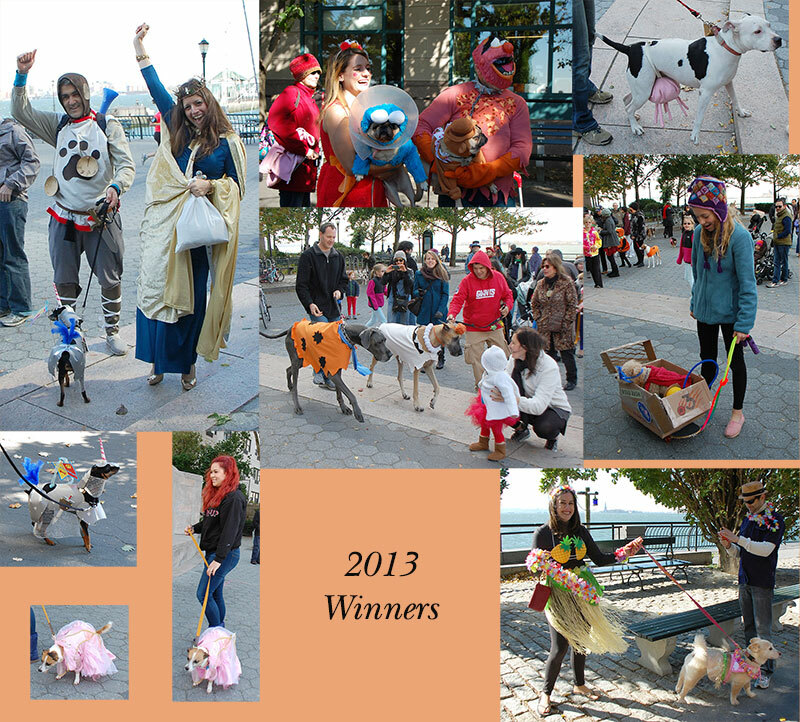 Co-sponsored by BPC Dogs and Le Pet Spa, we paraded along the Battery Park City Esplanade to the North Cove Marina, where we gathered at the Volleyball Court area for costume judging and prizes. You can see more photos of this wonderful event by clicking here. Sunday, October 2, 2016 – Blessing of the Animals. The annual BPC Blessing of the Animals took place on October 2 outside St. Joseph's Chapel on Kowsky Plaza. As always, this was a nice opportunity to welcome the fall season with a show of love and appreciation for our beloved pets. Click here for photos of the event. Tuesday, December 8, 2015 – The Battery Park Veterinary Hospital had their 3rd annual Pictures with Santa event to help raise funds for Mighty Mutts and Ollie's Place, an all-volunteer no-kill animal rescue organization. The Hospital also accepted toys, towels and food donations, also for Mighty Mutts and Ollie's Place. Saturday, October 31, 2015 – Everyone had a great time at the Fourteenth Annual BPC Halloween Puppy Parade which was held at noon on the BPC Esplanade on Halloween, co-sponsored by BPC Dogs and Le Pet Spa. The winners of our prizes were: Best Owner/Dog Combo: Emma as Hillary Clinton, with her Secret Service friend, and Roxy as Donald Trump; Best Dog Team: Roxy as a police officer, Buster as a prisoner, and Shirley Curly as Buster's pen pal girlfriend (owner is Jillian); Best Costume, Large Breed: Brigh as a pumpkin with a Mets bandana (owner is Mark); Best Costume, Small Breed: Oski as a gift of love (owner is Bella); Best Large Dog Tail Wagger: Sydney in a bacon costume (owner is Henrietta); and Best Small Dog Tail Wagger: Jillian's Roxy (the police officer in the best dog team). You can see more photos of this wonderful event by clicking here. Sunday, October 4, 2015 - Blessing of the Animals. The annual BPC Blessing of the Animals took place on October 4 outside St. Joseph's Chapel on Kowsky Plaza. This was a nice opportunity to welcome the fall season with a show of love and appreciation for our beloved pets. Click here for photos of the event. Saturday, October 25, 2014 - The Thirteenth Annual BPC Halloween Puppy Parade was held on Saturday, October 25, on the BPC Esplanade, starting at the South Cove wooden arbor, and proceeding on the Esplanade to the plaza area near the North Cove Marina (where the volleyball courts are usually set up) where costume judging took place. The winners of our prizes were: Best Costume, Small Breed: a tie between Laika (geisha girl) and Summer (hazmutt); Best Costume, Large Breed: Miles (warrior); Best Dog Team: Madison (Big Bird) & Elvis (Cookie Monster); Best Owner/Dog Combo: a tie between Addie (owner & lamb), Ryder (lamb) & Piper (sheep dog) and Maddy (owner & cowardlylion) & Dilley (Dorothy); Best Small Dog Tail Wagger: Clemenza (hot dog); Best Large Dog Tail Wagger: Willow (alligator). You can see more photos of this wonderful event by clicking here. Sunday, October 5, 2014 - Blessing of the Animals. The annual BPC Blessing of the Animals took place on October 4-5 outside St. Joseph's Chapel on Kowsky Plaza at 12:45 pm. All were invited to bring their pets to this non-denominational blessing, and all pets were welcome. This event was a nice opportunity to welcome the fall season with a show of love and appreciation for our beloved pets. Click here for photos of the event. 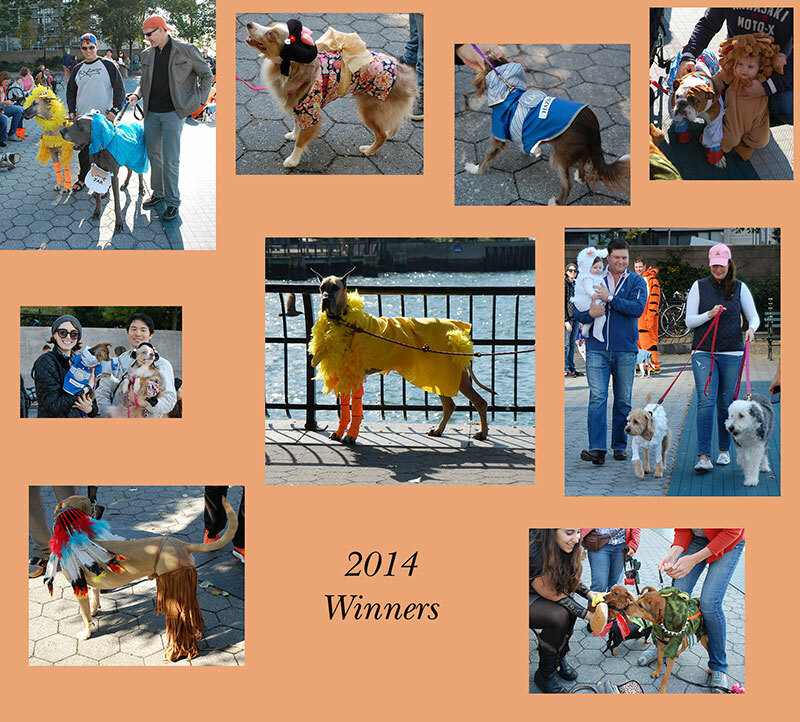 Saturday, September 27, 2014: The Thirteenth Annual BPC Block Party Pet Parade took place on the BPC Esplanade on at 12:30 pm. ALL pets were welcomed -- dogs, cats, birds, hamsters, rats, lizards, etc. The pet parade was a fun way to introduce neighbors and their pet to the community. Saturday, October 26, 2013: The Twelfth Annual BPC Halloween Puppy Parade took place on the BPC Esplanade on Saturday afternoon, October 26. The winners are shown above. Clockwise, from the top left are: Leo and Claudine with Pacino, as the Court of Prance-a-Lot (Co-winners of the Best Owner/Dog Combo); Jessica and Michael with Joni and Miro, as the Muppets (Co-winners of Best Owner/Dog Combo); May as a cow (Best Costume, Large Breed); Eleanor with Mia, as a race car driver (Best Costume, Small Breed); Annie with Kalin (Best Tail-wagger, Large Breed); Nadia with Sasha (Best Tail-wagger, Small Breed); and in the center, the great danes Madison and Elvis, as the Flintstones (Best Dog Team). Click here for more photos. Sunday, October 6, 2013 - Blessing of the Animals. The annual BPC Blessing of the Animals took place on October 6 outside St. Joseph's Chapel on Kowsky Plaza. Fr. Joe Tyrell of St. Joseph's and Reverend Mark Francisco Bozzuti-Jones of Trinity Church presided over this non-denominational service. Click here for photos of this wonderful event, welcoming the fall season with a show of love and appreciation for our beloved pets. Thursday, May 23, 2013. Dog Trainer Q & A to be held at Le Pet Spa in Battery Park City, from 5:30 to 7:30 pm. Bring all of your questions to Le Pet Spa on Thursday evening, meet and take part in a Q&A with dog trainer, Jane Kopelman. Although Jane is there to answer all of your dog-related questions, space is tight so please do not bring your dog to the Q&A. Sunday, November 3, 2012. Hurricane Sandy is now behind us. Battery Park City was amazingly spared the kind of devastation felt by many other parts of New York and New Jersey, including parts of FIDI just next door. With power back on for many of us, it's gratifying to see downtown residents getting together to try to help those in less fortunately paths of the storm. Halloween now seems so long ago. 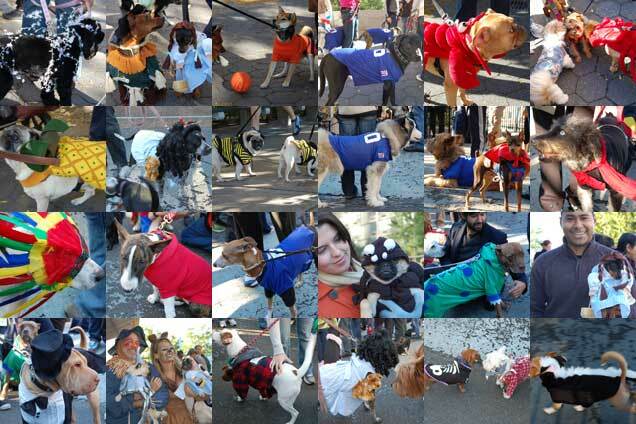 Last weekend, though, on the eve of the storm, we held our Eleventh Annual BPC Halloween Puppy Parade. We've finally had a chance to post some photos of that wonderful pre-storm event. Click here to see them. Sunday, September 30, 2012 - Blessing of the Animals. The annual BPC Blessing of the Animals took place on September 30, 1 pm, outside St. Joseph's Chapel on Kowsky Plaza. Click here for photos of this wonderful neighborhood event. Saturday, September 22, 2012 - BPC Block Party -- PET PARADE!! Once again, BPC Dogs co-hosted the annual BPC Pet Parade with Bobby of Le Pet Spa, at the BPC Block Party. Pets of all kinds participated in this fun way to introduce ourselves and our pets to the community. SUNDAY, October 30, 2011: The Tenth Annual BPC Halloween Puppy Parade went off a a day late, because of the snow storm, but everyone had a great time after the storm cleared. The parade proceeded from the South Cove on the Esplanade to the plaza area near the North Cove Marina (where the volleyball courts are usually set up). Prizes were awarded for Best Costume - Large Breed; Best Costume - Small Breed; Best Owner & Dog Combo; Best Dog Team Costume. A Tail-Wagging Contest for Small & Large Dogs was also held again this year. We'll be posting the info on the winners shortly, but in the meantime, you can click here for photos of the great event. Sunday, October 2, 2011 - Blessing of the Animals. 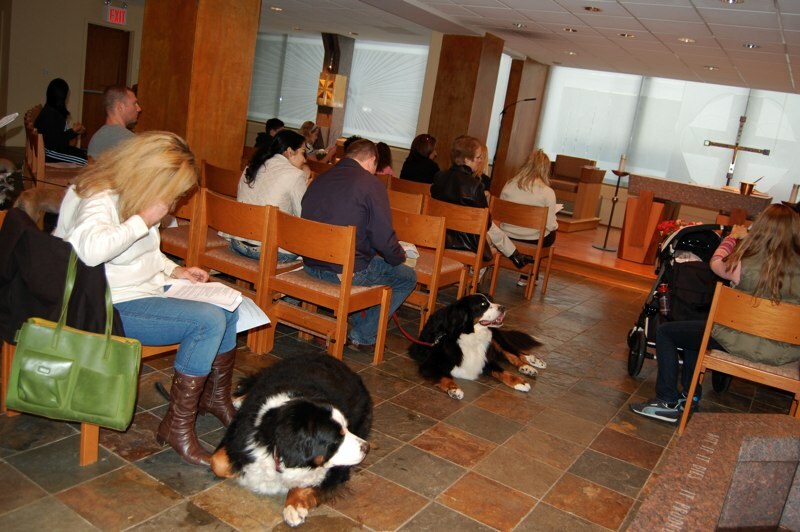 The annual BPC Blessing of the Animals took place on October 2 at St. Joseph's Chapel on Kowsky Plaza. Click here for photos of this wonderful event, welcoming the fall season with a show of love and appreciation for our beloved pets. Friday, September 2, 2011 - Goodbye Irene! Thank goodness that Downtown dodged Irene's bullets. With life getting back to normal, we want to express our thanks to all of you who helped one another in dealing with pets during the evacuation. We learned 10 years ago that making sure our pets are safe can be one of the most difficult parts of an emergency. Special thanks go to Gayle Horwitz and Ann Fenton of the Battery Park City Authority, who reached out to BPC Dogs to make sure we were part of BPCA's Hurricane planning; to Mary Cooley and Senator Daniel Squadron, who provided additional information regarding pet-friendly hotels; and to Sara DeLaney of Ciao Bow Wow (on Maiden Lane outside Zone A), who offered her doggie day-care facilities to anyone who could not find a place for their dog during the storm. Sara wants us all to know that she will do the same thing in any future emergency and that she is there for our community. Finally, we have heard countless stories of individual generosity and help offered by neighbor to neighbor. Our neighborhood spirit got us through 9/11 and it's great to hear that this spirit remains 10 years later. In order to remain prepared for future emergencies, please take some time to review the NYC OEM website, which has several useful guides available on-line, providing guidance for how to deal with a hurricane and other emergencies. The OEM guide for evacuating with pets is particularly helpful. STAY SAFE. Saturday, April 30, 2011 - Spring Party and Fundraiser! BPC Neighbors Network, of which BPC Dogs is a member, is sponsoring a Spring Party on April 30 that will also double as a fund-raiser for Japan earthquake relief, continuing the neighborhood tradition of giving back to others in recognition of all of the help that we received from around the world after September 11. The party will be at Southwest Restaurant in the World Financial Center, starting at 8 pm. There will be a $20 per person cover charge, which includes discounted margaritas hors d'oeuvres and a donation for Japan relief. Click here for flyer. Saturday, October 23, 2010 - the 9th Annual BPC Dogs Halloween Puppy Parade, co-sponsored by BPC Dogs and Le Pet Spa, was a great success. We started at noon on the BPC Esplanade at the South Cove Marina and marched north on the Esplanade to the plaza area near the North Cove Marina, where we were joined by State Senator Daniel Squadron and dozens of spectators. Prizes were awarded for Best Costume - Large Breed; Best Costume - Small Breed; Best Owner & Dog Combo; Best Dog Team Costume. We also had a Tail-Wagging Contest for Small & Large Dogs. Click here for photos of our fantastic winners, and, here for a slide show of the entire event. Rain date: Sunday, October 24, same time and place. Check this website if the weather looks bad Saturday morning or call Le Pet Spa at 212-786-9070 for up-to-the-minute weather updates. Sunday, October 10, 2010 - Blessing of the Animals. The annual Blessing of the Animals took place at St. Joseph's Chapel on Kowsky Plaza in Battery Park City on October 10. This non-denominational service was a wonderful community event. Click here for photos. July 27, 2010 - Longtime BPC pets pass on. With great sadness, we report that BPC has recently lost some longtime beloved pets. Shenanigan, the Bernese mountain dog, and Jamie, the Chihuahua passed away over the last few days. We extend our heartfelt condolences to their owners. May 30, 2010 - West Thames Dog Run Update. The West Thames Dog Run has reopened, after completion of construction work within the temporary dog run area. A few punchlist items remain to be worked out, but we are glad that the new run is able to serve our pets for the summer. Saturday, October 31, 2009 - the 8th Annual BPC Dogs Halloween Puppy Parade, co-sponsored by BPC Dogs and Le Pet Spa, was held on Saturday, October 31, along the Esplanade in BPC. Pictured above are the winners of the costume contests. 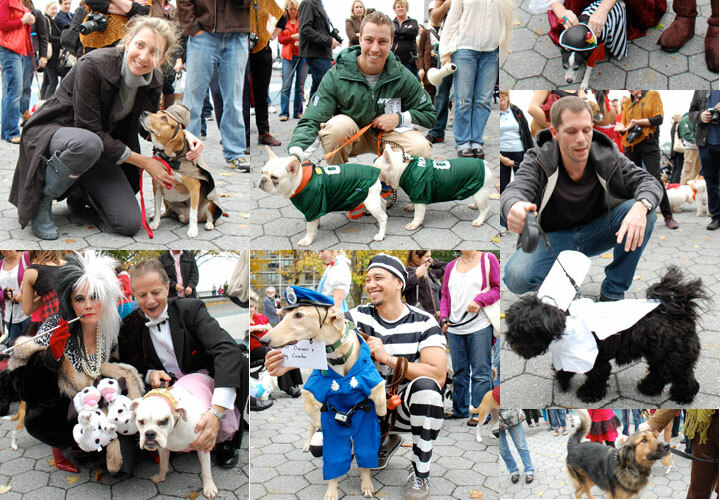 Clockwise from top left are: Kelly with her dog, Boo, as Sherlock Holmes (Best Costume Large Breed); Seth, with his dogs, Mazzie and Miles, as the New York Jets (Best Dog Team); Pito (owners Carol and Thomas), Small Dog Best Tail Wagging; Jason, with his dog, Otis, as a chef (Best Costume Small Breed); Jack (owner Claire), Large Dog Best Tail Wagging; Thomas and his dog, Lucky, as police dog and prisoner (Co-winner, Best Owner-Dog Combo); and Laura and Gary, with their dog, Sadie, as Dracula, Cruella and their retired ballerina (Co-winner, Best Owner-Dog Combo). Click here to see photos of the entire event. We would like to extend a special thanks to our judges: Glenn Plaskin, Patti Brotman and Pauline Wolf. Sunday, October 4, 2009 - Blessing of the Animals. The annual Blessing of the Animals took place at St. Joseph's Chapel on Kowsky Plaza in Battery Park City on October 4, at 1 pm. Click here for photos of this wonderful neighborhood event. June 4, 2009 - Animal Rescue Benefit Event Two of our members, who are affiliated with Friends of Animal Rescue, a non-profit organization that provides much needed funding to help NYC rescuers remove animals from death row at city shelters, have extended an invitation to a fund-raising event that will be held in our back yard on June 4. From 6:30 pm to 9:00 pm, the fund-raising party will be held dockside at the North Cove Marina near Gateway Plaza. Then, at 9:00 pm, the mega yacht Atantis moves out into the harbor for a one-hour cruise. Sunday, October 26, 2008 - the 7th Annual BPC Dogs Halloween Puppy Parade, co-sponsored by BPC Dogs and Le Pet Spa, was held on Sunday, October 26, along the Esplanade in BPC. We started on the plaza where volleyball courts are usually set up near the North Cove Marina, and then paraded south on the Esplanade to the West Thames Street Dog Run, where judging took place and prizes were awarded. This event is co-sponsored by BPC Dogs and Le Pet Spa. Click here for photos. Sunday, October 5, 2008 - Blessing of the Animals. The annual Blessing of the Animals took place at St. Joseph's Chapel on Kowsky Plaza in Battery Park City on October 5. This non-denominational service was a wonderful community event. Click here for photos. April 5, 2008 - Intro 13: Important Pet-Friendly Legislation. Nearly 2 years ago, Councilmember Tony Avella, of Queens, introduced legislation to clarify tenants' rights to replace a pet who may be lost to old age, accident or disease. This legislation has garnered 30 additional sponsors, including our own Councilmember, Alan Gerson. Unfortunately, Speaker Quinn has not allowed Intro 13 to come to a vote. On April 5, supporters of Intro 13, including BPC Dogs leaders and leaders of NYCDOG, the City-wide association of dog-owner groups, held a press conference at City Hall to demand action on this important legislation. October 28, 2007 - the 6th Annual BPC Dogs Halloween Puppy Parade, was held today along the Esplanade in BPC. We started at the South Cove, and marched toward the North Cove and on to the Sirius Dog Run at Kowsky Plaza. It was a beautiful day, and dogs and humans had a wonderful time. 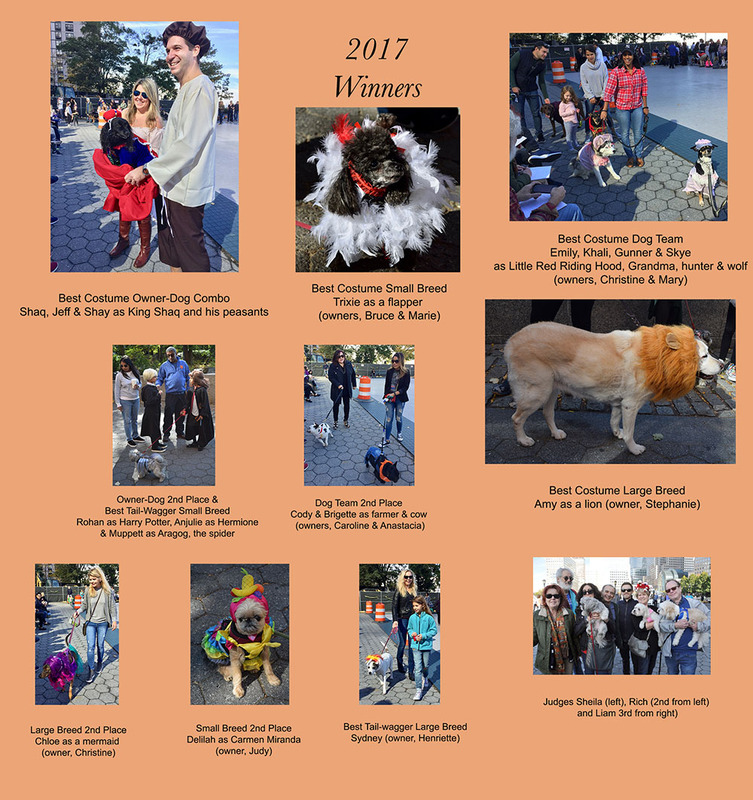 Prizes were awarded for Best Costume - Large Breed; Best Costume - Small Breed; Best Owner & Dog Combo; Best Dog Team Costume; and best best Small and Large Dog Tail-Wagging. Click HERE for Photos. August 20, 2007 - Suspected Dog Poisoning in Nearby Dog Run. There have been reports of dog poisonings at the Chelsea Waterside Dog Park. There have been no reports of similar activity in the BPC dog runs, but please be on the lookout. If you spot suspicious activity report it, use your cellphone camera to take a photo, get the attention of other dog owners nearby, and, most of all, be mindful of your dog. Watch for items left on the ground. If strangers appear to be feeding dogs, intervene. Here is a link to a WCBS story on the Chelsea incidents. February 15, 2007 - Dog Electrocuted in our neighborhood. The 2/15/07 New York Times, reports that a dog has been electrocuted in our neighborhood, at Greenwich Street and Rector Street. Unfortunately, electric shocks from poorly insulated ground wiring are not uncommon. The problems are particularly severe on snowy, rainy or slushy days, especially when there is salt on the ground, because both water and salt can act as a conductor. Please see our Electric Shock Safety Page for important information on how to avoid this danger. October 29, 2006 - the 5th Annual BPC Dogs Halloween Puppy Parade was held on the BPC Esplanade today, starting at the Volleyball Court near the North Cove Marina. Strong winds, threatening to blow the costumes off our local canines, caused a mid-parade route change, with everyone heading for the nearby Sirius Dog Run, rather than the North End Avenue Dog Run, as had been planned. We had a big crowd of brave, windswept dogs, with prizes awarded for Best Costume - Large Breed, Best Costume - Small Breed, Best Owner & Dog Combo and Best Dog Team - and Best Tail-Wagging Dogs. Click here for photos. October 1, 2006 - Annual Blessing of the Animals. On Sunday, October 1, St. Joseph's Chapel in Battery Park City held its annual Blessing of the Animals in celebration of the feast day of St. Francis of Assisi. It was a beautiful day and gave us a nice opportunity to welcome the fall season with a show of love and appreciation for our beloved pets. Click here for pictures. June 19, 2006 - Gateway residents: Please do not let your dog urinate near the Steamers Landing Restaurant outdoor seating areas. Steamers is a great friend and neighbor to the BPC community. February 14, 2006 - Angel on a Leash. One of our members, Greer Griffith, was honored at the Westminster Dog Show , for her work in coordinating a wonderful program with therapy dogs, called Angel on a Leash, which is sponsored by the Westminster Kennel Club. Angel on a Leash brings theapy dogs to the Morgan Stanley Children's Hospital where the therapy dogs not only visit children at the hospital at their bedside, but they also work in occupational and physical therapy sessions. October 29, 2005 - the 4th Annual BPC Dogs Halloween Puppy Parade was held on the BPC Esplanade, starting at the South Cove, and proceeding north to the new Sirius Dog Run. Prizes were awarded for Best Costume - Large Breed, Best Costume - Small Breed, Best Owner & Dog Combo and Best Dog Team. Click here for photos. HURRICANE KATRINA - For those of you interested in the animal rescue efforts going on in the wake of Hurricane Katrina, and how we might contribute to that effort, we have compiled information here regarding various organizations involved in the animal relief work, including links to these organizations' websites. In addition, BPC Dogs is working with the BPC CERT Animal Search and Rescue Team and City Critters to amass information and identify people who would foster and/or adopt animals rescued from the hurricane zone. September 8, 2005 - Dedication ceremony for the naming of the new Kowsky Plaza dog run for K-9 Sirius, the Port Authority police dog killed on 9/11 - the only police dog killed in the attacks. This moving ceremony took place September 8 on Kowsky Plaza next to the North Cove Marina in BPC. Click here for photos. 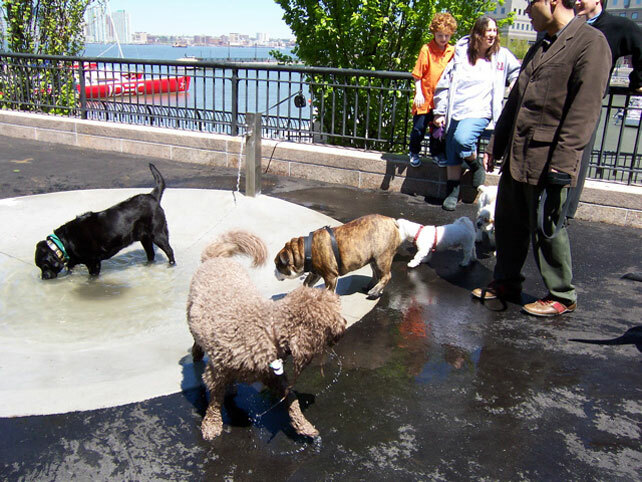 May 9, 2005 - The NEW DOG RUN on Kowsky Plaza opened Monday, May 9. If you have not yet visited the dog run, you and your dog are in for a treat, complete with bathing pool and small hills for the dogs, and benches and wonderful views for the humans. Kowsky Plaza has become BPC's "town square", and not just for dog owners. Click here for photos. January 2005: See ELECTRIC SHOCK for important information about serious electric shock hazards in BPC. The Third Annual BPC Halloween Dog Parade was held on Saturday, October 30, 2004, starting at the Esplanade Plaza next to the North Cove Marina - and heading to the BPC South Dog Run (Battery Place & 3rd Place), where prizes were awarded for Best Costume - Large Breed, Best Costume - Small Breed, Best Owner & Dog Combo and Best Dog Team. December 2003: Mercy, our local stray dog finds a home! Word has it that NYC will be cracking down on unlicensed dogs. See this June 19 article in the New York Post, for one report on this subject. It's easy to license your dog. You can download an application at the NYC DOH website. PEP "Zero Tolerance" Campaign -- UPDATE, March 17, 2003: As a result of meetings between BPC Dogs and BPCA representatives, we think the PEP situation should be back to "normal" now, after an ill-starred experiment with a strict "zero tolerance" enforcement policy. PEPs will most definitely still be on the look-out for dog-related violations, but enforcement going forward should be tempered by more common sense, with warnings, rather than summonses, being the weapon of first choice. Officials have pledged not to re-institute "undercover" dog regulation enforcement in BPC without prior consultation with BPC Dogs. If you nonetheless have PEP problems, please email us with the details. We will try to help. Our own Bobby Concister of Le Pet Spa talks to the Daily News about preparing with your pet in these days of terror alerts. Join BPC Dogs to stay informed, and to show your support for new BPC Dog runs. BPC Dogs is a volunteer organization with approximately 600 members dedicated to responsible dog ownership in the Battery Park City community. Through our email distribution list, we keep our members informed of news and developments of concern to dog owners and dog lovers in and near Battery Park City. From helping pet-owners recover their animals after September 11 to working to make BPC once again a safe and welcoming neighborhood for dogs and their owners, we are here to serve you. We are a member organization in the New York Council of Dog Owner Groups (NYCDOG). Send BPC Dogs Your Kids' Dog Art!